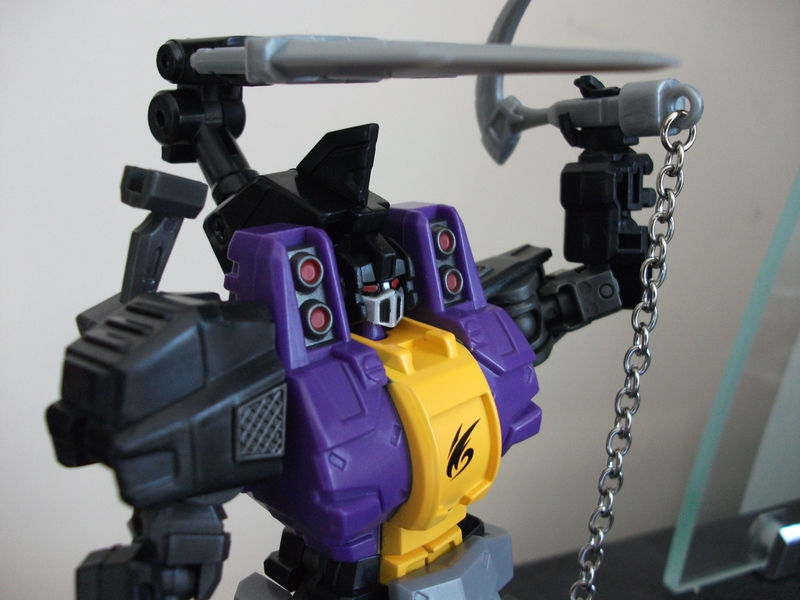 In my last Transformers post I reviewed the unofficial Quintesson Judge toy. Unofficial in that it was made by a 3rd party company and not Hasbro who holds the rights to the Transformers brand. I told you how that purchase had set me on a long dark path of purchasing cool 3rd party bootlegs. Well this here is another awesome one. He was just released by Fans Project and he is called Stormbomb. Of course anybody that knows anything about Transformers knows that this is actually Bombshell whose name has been altered to avoid legal drama. Bombshell was one of the 3 Insecticons (a subsection of Decepticons) released in 1985. Doug had the original Bombshell who transformed into a rhinoceros beetle and I had Shrapnel who transformed into a stag beetle. Neither of us had the third member of the gang, Kickback who transformed into a grasshopper. When these guys came out I frig’n loved ’em. I’ve never been much of a car guy, even now in my 30s I still don’t have a driver’s license so that aspect of Transformers never interested me much. In most of my reviews I don’t even mention the robot’s alt mode because I just don’t care. When the Dinobots and Insecticons were introduced though, that got me excited. The Insecticons didn’t turn into lame bugs they turned into cool bugs, not some stupid housefly or lady bug, these beetles were badass. Shrapnel was easily one of my favorite Transformers. I loved how they were portrayed in the cartoon series as well. They were smart, sinister and actually kinda creepy. Especially Shrapnel who talked in this weird double speak “Let’s Attack, attack” “Here comes Optimus Prime, Prime”. 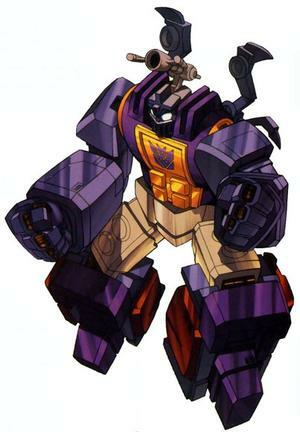 Bombshell had a cool feature in that he could shoot cerebro shells from his horn which would attach themselves to other Transformers allowing him to control their minds. In was a nifty idea that really made Bombshell one of the more menacing Decepticons and Doug and I used it a lot when playing. The old figures were pretty good back in the day but they don’t look right standing next to modern day figures. These guys were near the top of my list of characters I was hoping Hasbro would release in the modern style. I guess I wasn’t the only one waiting as Fans Project took matters into their own hands to create these awesome figures. This new Bombshell figure is full on amazing. I highly doubt, actually I’m quite certain that Hasbro could not have done a better job than this. This figure is nearly a perfect update of the original Bombshell. I actually can’t find anything to complain about. Actually on closer inspection (I just spent 5 minutes looking at it) there is one thing missing. The original, in bug mode had these great big creepy yellow eyes which I loved. This one, perhaps more realistically does not, but I don’t feel it’s an improvement. My figure will stay in robot mode though so it doesn’t really bother me. And what a robot mode it is. The face is fantastic. It looks like the original but with more personality. The stacked shoulders give him some added bulk and make him seem tougher than he ever did before. The horn is also much deadlier looking, more like a scorpion’s tail than a dinky little laser cannon. The color choices are perfect, matching the original brilliantly. It’s a very posable figure as well which the original was not. One of the coolest aspects of this toy is the weapon. That scythe/nun-chuck chain weapon is f**king gnarly. I love it. 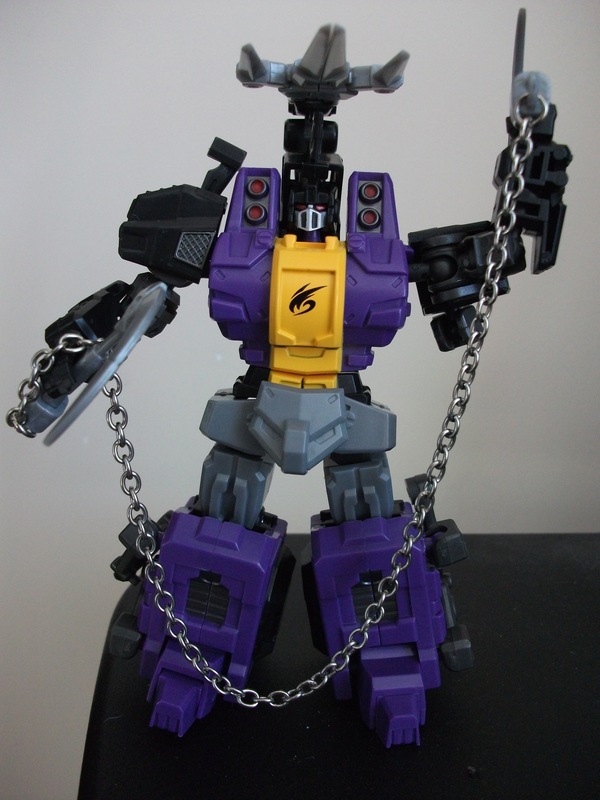 The chain’s nice and long and can be draped over him in all kinds of cool ways. This might possibly be my favorite Transformer toy. 10 out of 10. Posted on March 15, 2012, in Transformers. Bookmark the permalink. Leave a comment.